The Hollywood actor was on a trip with his film production company when he stopped for lunch at The William Bray in Shere on August 29. Pub owner Julian Bailey is accustomed to entertaining famous names as the former Formula One star often hosts his motorsport and Top Gear buddies at the William Bray, but even he was a little star struck when gorgeous George appeared. He said: "Someone had made the booking for a particular table and said that there would be a famous name in the party. "But for some reason it had been booked for the following week so we weren't expecting anyone. I was with my wife and son when he came in and it was my son who recognised him. 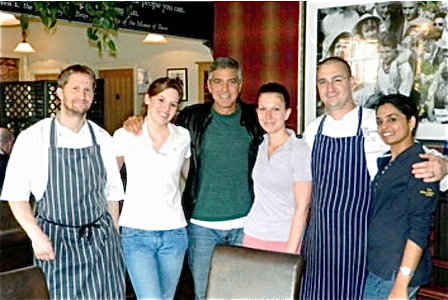 "George was very polite and pleasant to the waitresses – who were a little flustered – and he certainly seemed to enjoy his meal." Shere is already a well known feature film location and was the setting for the film 'The Holiday' back in 2006 whose stars Jude Law and Cameron Diaz became regulars around the village before and during the filming. With other titles such as Brigit Jones' Diary and the series Foyle's War to its credit. It seems unusual to me that it is only now published. When the Germany lunch was published pretty quickly on the 2nd of Sept. It was on the 1st tho. The Surrey one was in August 29th. Guess someone realized it hadn't been published much yet. Who knows why they waited until now to publish it. Maybe they thought it would be politer to wait? I'm happy to see that it looks as though he'll be filming some of this in the UK.